Hurray, spring has arrived here in Michigan! Finally we’re seeing buds on trees, robins and other birds and it was 71 degrees on Sunday. Mr. Cottage and I have been retired for a number of years now. 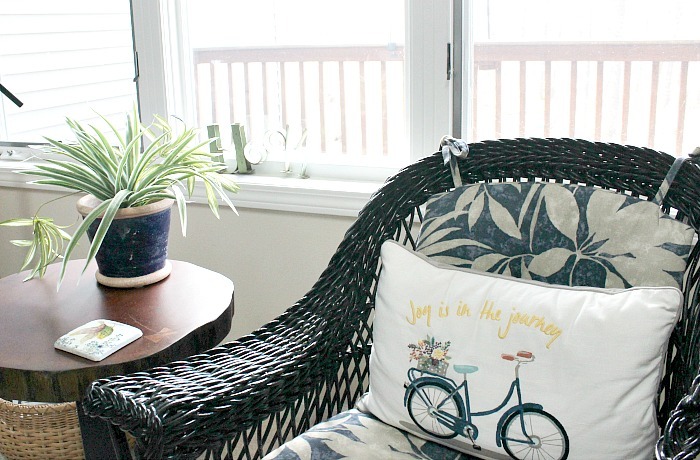 Living on a fixed income, I’ve learned over the years how to decorate by not spending any money or very little when each season rolls around. 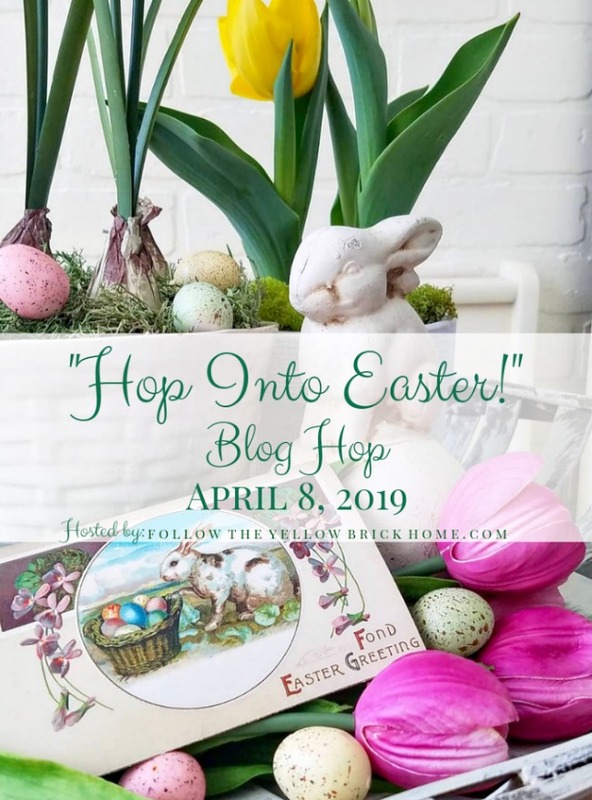 Amber, from Follow The Yellow Brick Road, has graciously organized today’s blog hop, Hop Into Easter, with over 30 bloggers. If you’re coming over from Debbee’s Buzz, “Welcome!”. Isn’t her house beautifully decorated for Easter! She’s amazing! 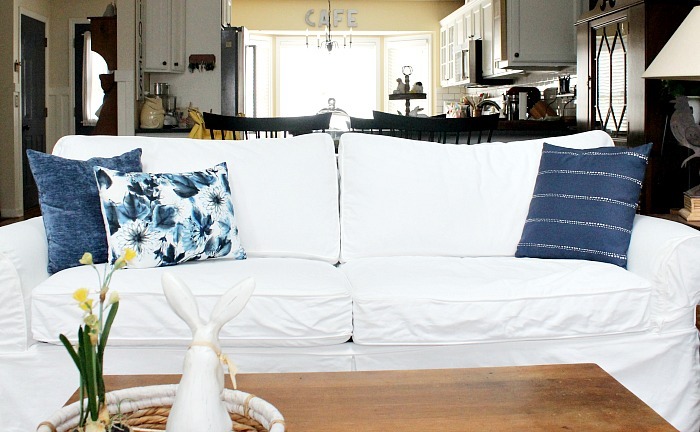 The first thing I do when looking to redecorate for the various seasons is to shop our house. Everything on our mantel I already had. I made this DIY moss covered bunny just over 3 years ago. You can find the tutorial here. I also bought the daffodils above over three years ago from The Dollar Tree. Take good care of your items and they’ll last you a long time. If you want to know more about the tall grass, it’s all in the same blog post as my moss-covered bunny I linked above. I would love to get a real mantel someday, but until I come up on where to put one, our faux mantel will have to do for now. Personally, Mr. Cottage and I like having our TV where it is now and not high above a fireplace mantel. 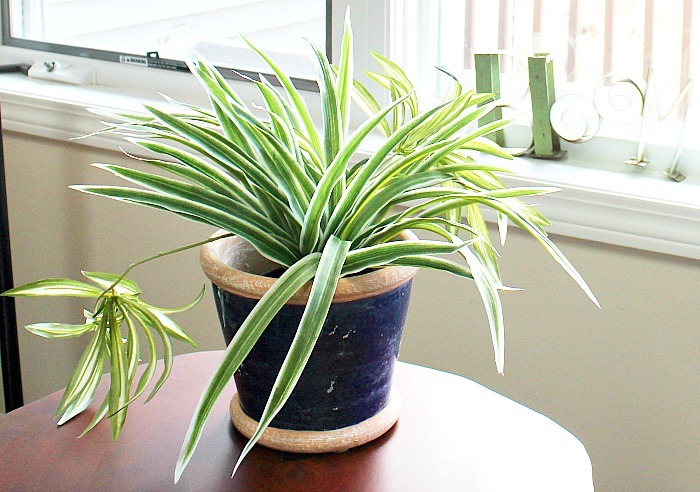 Confession time…I just bought the blue pot and the spider plant; BUT I used a gift card! Not only that, I love that I can leave this out all year. The plant looks so real and I just loved this pot when I saw it. They were both on sale from Pottery Barn, but again, I paid with a gift card I had. 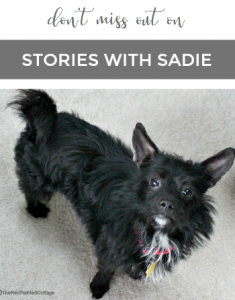 I had a huge surprise the other day when I went to take off the lumbar pillow cover. I found this green cover still on the pillow insert. I made it a number of years ago when we still lived in our other house and completely forgot about it. I love the accent it gives to the room, plus it almost matches the green on the sheep pillow and the sign hanging on the wall. It’s perfect for spring and summer! I did buy two pillows the other day at Pier One while they had a sale on buy one pillow and get 50% off on the second pillow. I bought the two on the left side for a total of just over $20 for them both! Now to be perfectly honest, the only time I use all our pretty pillows on our couch is when company comes over. So I played around and came up with these options that looks good. This is Option 1, where I use two pillows on each side. I tried it with three on one end and it just didn’t look good. Option 2, I used just the one blue pillow on the one end. Option 3, I used my white pillow on the one end. Opinions please! Which of the above do you like best? I had all the above, plus they were on sale at the time I bought everything. The daffodil bulbs were on a final clearance at Pottery Barn ages ago. I finally finished all my jigsaw puzzles I was working on all winter and now I have room for a centerpiece once again. I was trying to keep things sweet and simple by reusing my birds nest I made two years ago. See the post here. 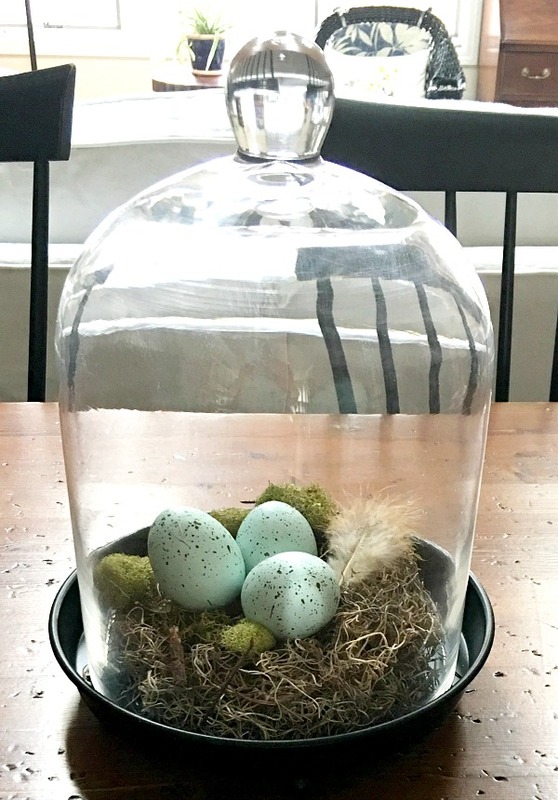 Both the moss bunny and this birds nest, I keep in separate bags and in a special drawer for my more fragile spring and Easter items. The eggs literally go into a cardboard egg carton before storing them in this drawer. Michael’s had a spectacular sale last week and I was able to pick up their white cherry blossoms. Normally one stem is $14, but for this sale, each stem was $5.60. I bought five stems and used another gift card I had. After cutting the stems, I used balled-up plastic bags to give more height in the center. Anywhere I felt it needed to be a tad higher, I took those bags and added them underneath the flower stems. Everything in the kitchen I’ve had for years. In my recent blog post about mantel ideas for spring, I took the pink tulips I had on our mantel and put them into our bedroom. I wanted yellow to be the main color I use this spring. If you’re following along on this blog hop, your next stop will be The Crowned Goat. 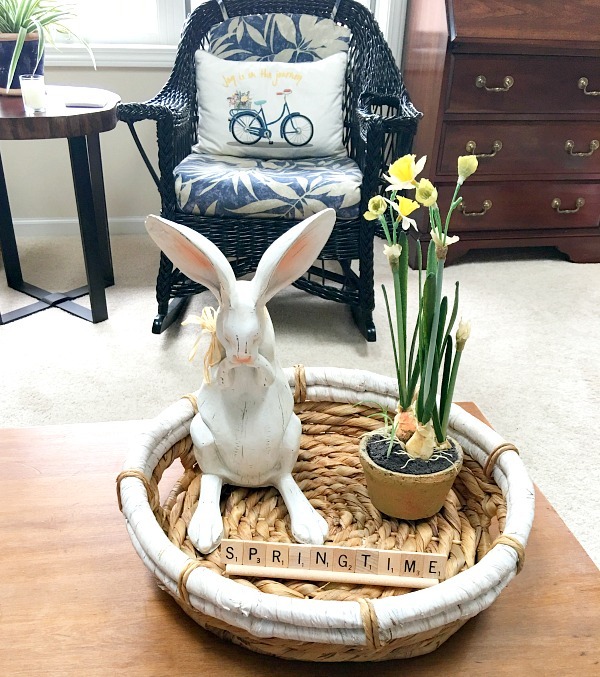 She’s added so many beautiful spring and Easter touches to her home. You won’t want to miss it! 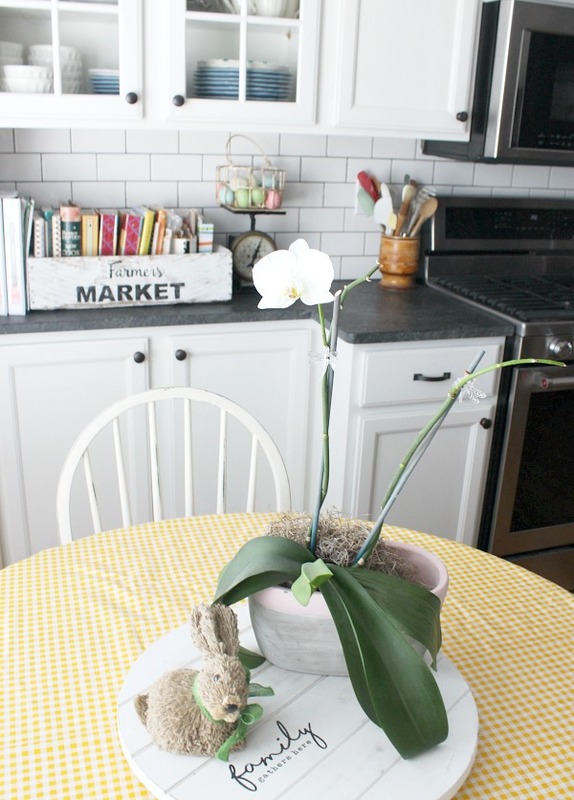 Carol, the Easter/spring decor looks so inviting. I vote for the first way of doing the pillows. With white on the end alone it disappears and looks unbalanced, I think. You know I think of you often as we share weather influenced by Lake Michigan. Thank goodness we were blessed with some spring this weekend! Yesterday we even went to Home Depot for some pansies, which will survive even with that darn snow predicted in several days. I will cover them though! 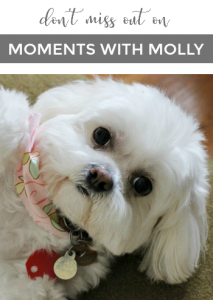 It is wonderfully springy Carol and I really love how you use what you have and supplement with a few new treasures. I try to do the same. Good "find" on that great green pillow and I love each and every detail! 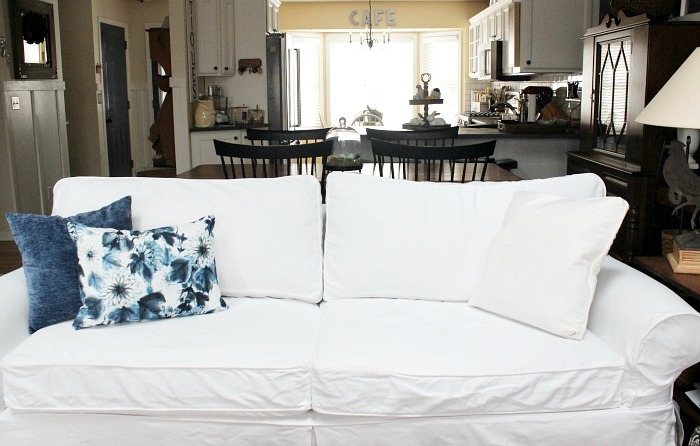 Regarding your couch pillows - 2 on each end, but put the blue one on the right against the back of the couch with the white one in front. It helps make the white one more visible. 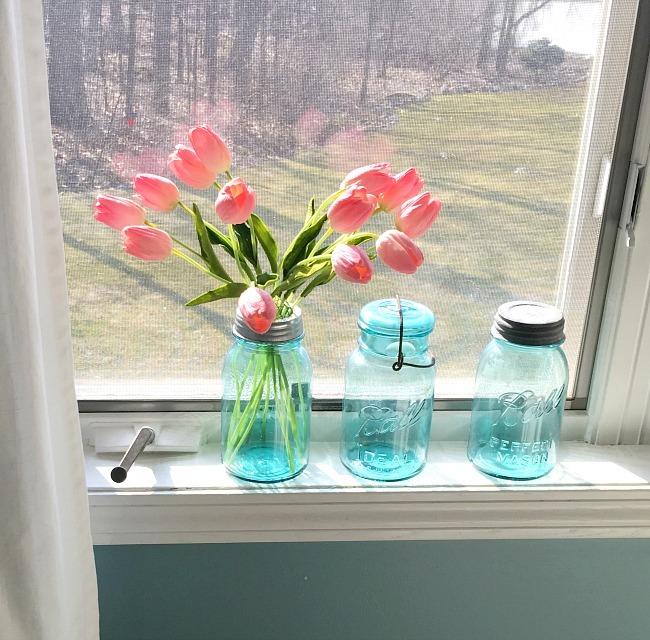 Love those tulips in mason jars in your bedroom - sure looks like Spring and Easter! I can't do a high t.v. either. I love your wall color. It's beautiful and your spring touches look lovely in the room. So pretty Carol....glad you are finally seeing signs of Spring. Carol you gave me so many great ideas for decorating on the CHEEP. :) Love your Easter vignettes. What a treat to find something you hadn't seen in years! Love the green with the other pillow too. Very cheerful. As for the other pillow options, I like option #1. Pier 1 has great pillows. Loved the tour - the perfect amount of Easter. Hello, I enjoy your newsletters they are always so fun! I had to look twice when you mentioned the white pillow in option 1 & 3 I didn't even see it at first. But I'm sure it shows up more in the room than on camera. I really like option 1 I think that's my favorite but I also like option 2 option 3 just looks lacking to me. Have fun playing that's what I like doing also changing things around so it makes my family look twice. Oh Carol, you had me at the very first moss bunny --- couldn't believe you made him yourself. You did a fantastic job! I have several moss bunnies, and they were pricey. But, yours looks every bit as well made as the ones I found at a florist job. I'm hopping over to your DIY to try it myself. --- cause I can always use another bunny...or two! Debbee, Thank you for your lovely comment about my moss bunny! I just love him and I make sure to take good care of him from year to year to make him last. I hope you find some paper mache bunnies. They should be in abundance this time of year. Happy Easter! Your spring decor is so lovely, Carol...beautiful colors! I love the look of that gorgeous old pitcher! Happy Spring Carol! Your home looks so happy with all the spring colors. 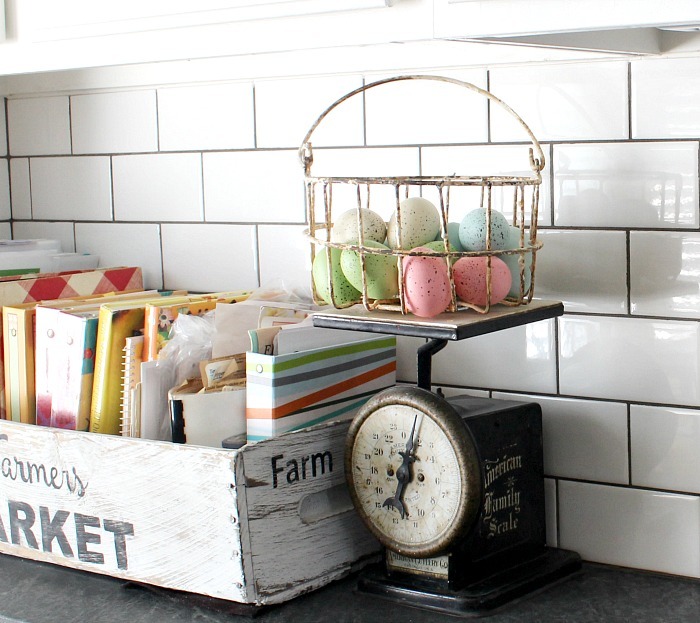 Love that little wire basket of eggs on the kitchen scale. Cute, cute!! Okay, first on the pillows, I would vote for using the 4 of them. Okay, all of your decor is perfect, it doesn't have to be new every year. I especially love the daffodils with the bulbs exposed, those look so realistic. The blue jars are lovely with the sun shining through them. So many cute elements. Happy Easter! Your home looks lovely decorated for spring! For the pillow options, I like the first one the best. I also agree with you on tv placement. 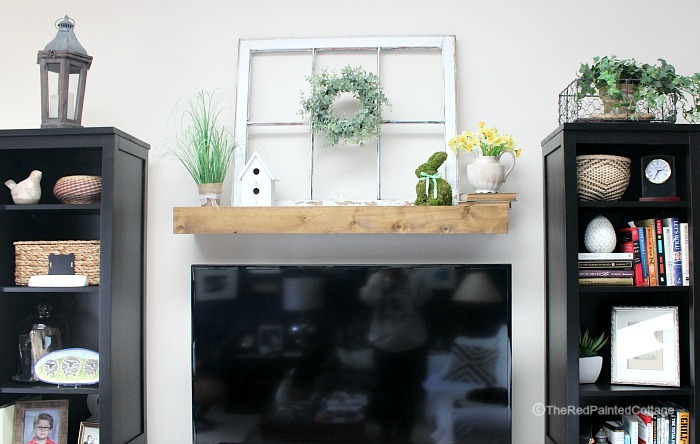 I wouldn't want to have to look up to watch a tv placed over a mantel if I were watching from a sofa or chair. I love it all Carol! 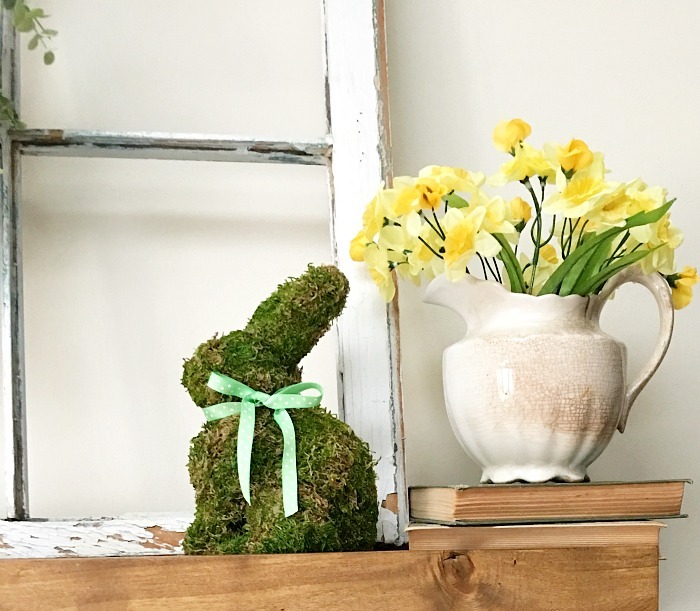 I love the moss bunny you made and your faux mantle is such a great idea! I love the Option 1 with your pillows on the couch, because I'm a pillow girl! I love the eggs in the basket on your scale too!! 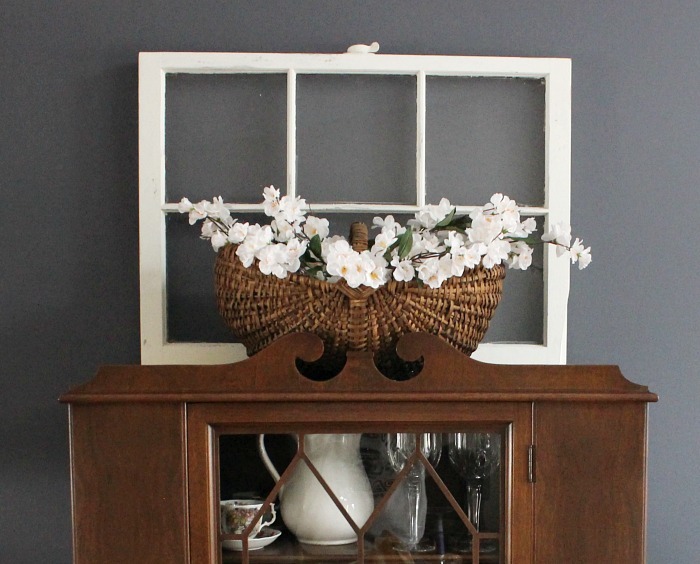 Hi Carol, Love that window on your mantel as a backdrop for your Spring decor. 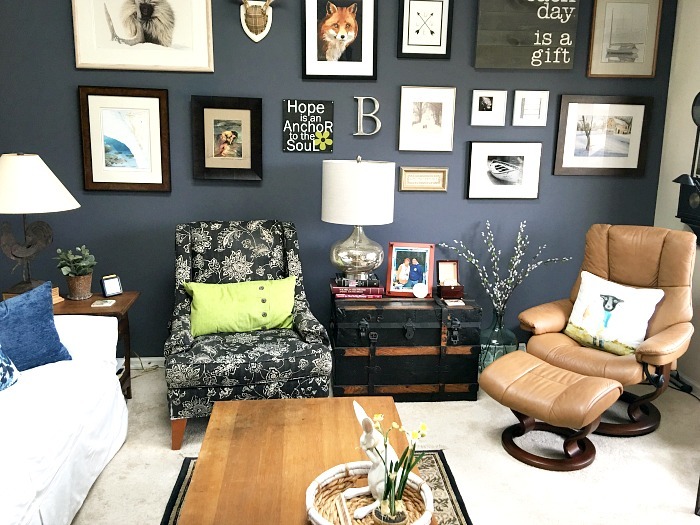 Your navy blue and white color scheme is wonderful, your gallery wall is amazing! Happy Easter! your home looks stunning decorated for Spring! I love the orchids! Carol, hi friend. Love all your springtime touches. For the sofa pillows, I didn't know there was a white one until you explained. I would go with a mix of option 2, with the one blue pillow on the right and the white one in front. 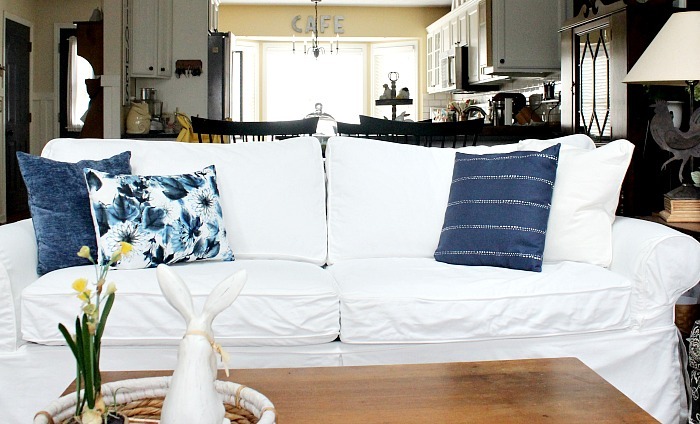 How about have the white pillow either monogrammed (sorry, it's a Southern thing) or stencil it yourself (ask me how) in a blue that is close to the pillows? I love all the blue mason jars on the window sill. Love how you reuse and recycle. my kind of girl. 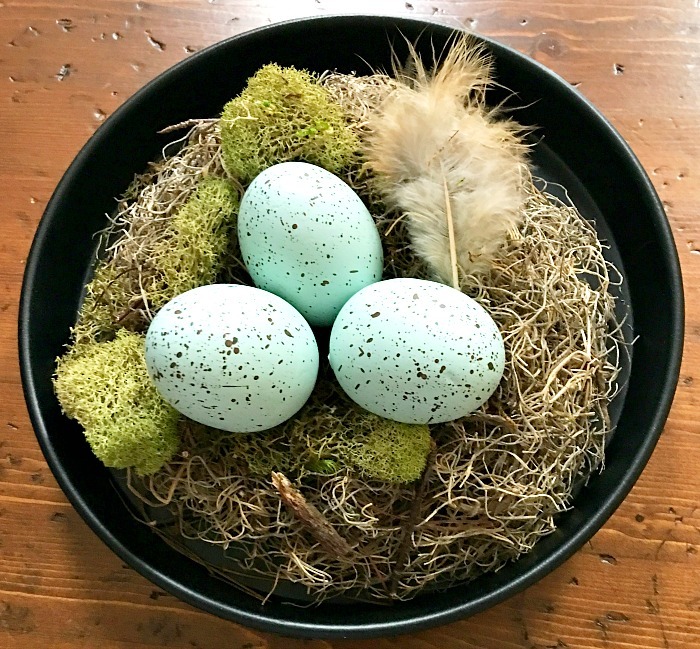 I absolutely love your shot of the 3 aqua eggs on the lichen and moss, Carol! It could be a calendar picture it's so classic and pretty. 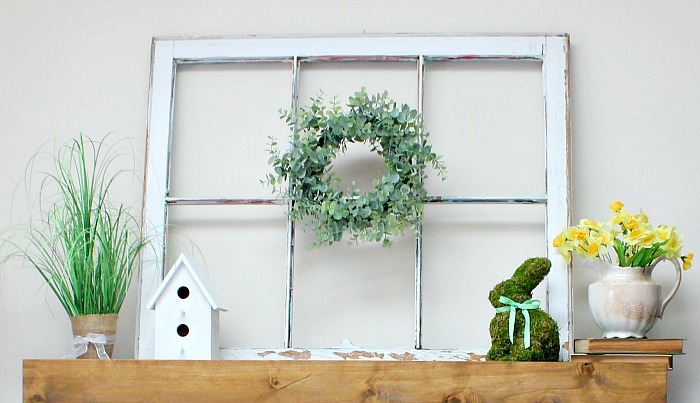 Love to see your thrifty Easter touches all around; goes to show you don't need to spend a lot for cute! 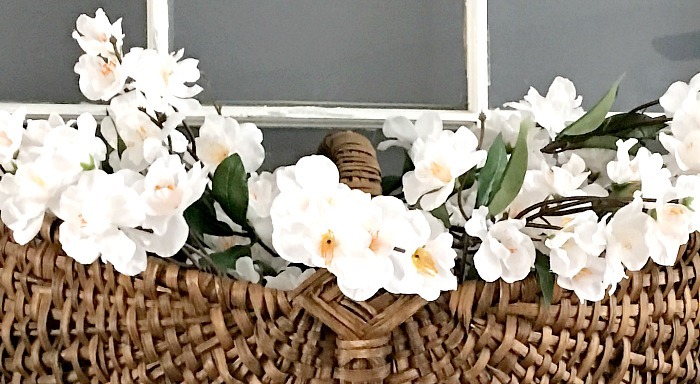 Love your Spring decor! I’m voting for Option 2 on the pillows. Happy Easter! 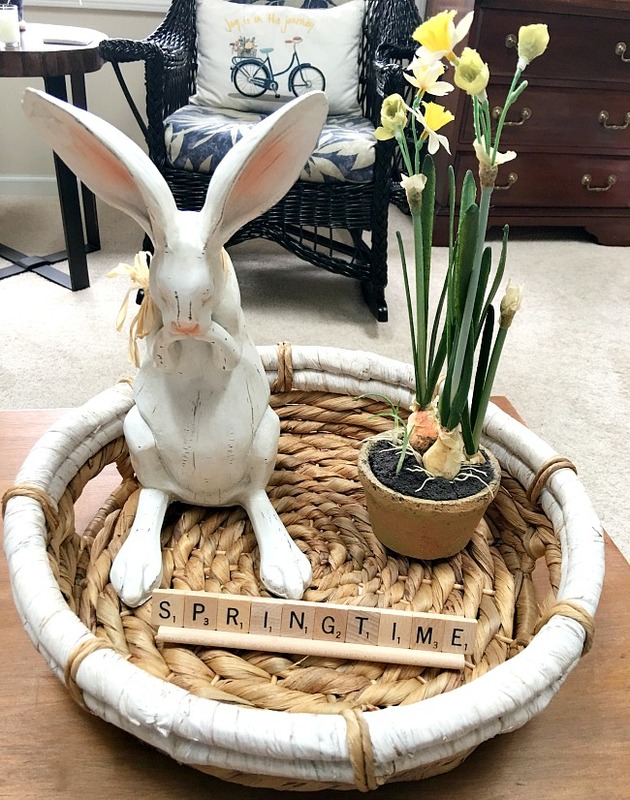 Carol, I love all your spring and Easter decor! It may all be on the cheap, but it certainly doesn't look cheap - it's all gorgeous! Happy Easter!